I remember being amazed by the liver when I learned about it at school several years ago. It has so many jobs in our bodies and does them all so well. Since we are entering into the season of overindulgence, I thought that our lovely livers should receive some attention and love. Eliminates toxins that we eat, drink, breathe in, put on our skin etc. Makes clotting factors to help prevent excessive bleeding after an injury. That is only a snapshot of the liver's job description, but I think it is probably pretty clear how important it is. The liver quietly works in the background. We often don't realize that some of the symptoms that we might be experiencing could be linked to a sluggish liver. Lucky for us, our livers are forgiving. Even if you think of yourself as a healthy person, a little liver lovin' never hurts. Don't worry, I'm not going to suggest a juice cleanse or a cleanse of spinach and celery! This is a simple and quick way to give your liver (and the rest of your body) a little love each morning. It is something that I used to suggest to most of my clients. Drink it with a straw to protect your teeth. For my clients who had limited time in the mornings, I would recommend that they make 2-3 days worth of lemon water at a time and store it in a jug in the fridge. Boil the kettle each morning and add a bit to warm it up to at least room temperature. It doesn't have to be but, warm or room temperature water gets absorbed by the body more easily. Cold water will not get absorbed by your body until your body has warmed it up. 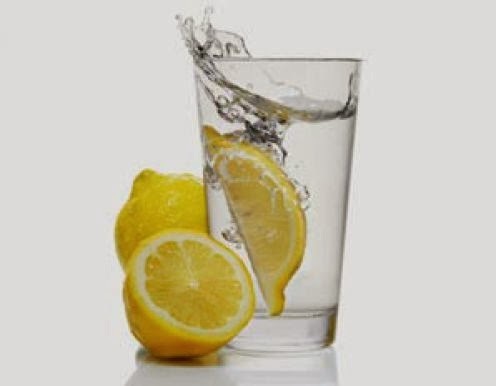 The point of drinking lemon water on an empty stomach is that it gets absorbed quickly and gets to the liver. I TOTALLY have all of those symptoms. I have a bad liver (?) WTH. I'm going to try your water trick. I'll let you know how it goes.